Suggested activities for a half day visit in Bishop. Click on each seasonal adventure for a what to do, how to get there, and the best time of day for it! Spring is a time for rejuvenation and growth. A hike in the canyons, washes, and on the plateau of the Volcanic Tablelands is a perfect half-day adventure for a restless traveler or avid explorer. The Volcanic Tablelands were formed as a result of a massive volcanic eruption a mere 760,000 years ago – very recent in geological time. This escarpment rises dramatically less than 5 miles north of Bishop. Two intriguing canyons are located in the tablelands north of Bishop and just east of Pleasant Valley Gorge along Chalk Bluff road. Known as the Happy and Sad boulders, these canyons are frequented by rock climbers for the big boulders and low canyon walls that present challenging “problems” for both beginner and advanced climbers. These two canyons also present great opportunities for short, interesting hikes within the canyon walls. Each canyon is about a mile long and trails curve in and around the rock formations that are sculpted in the soft rock that makes up the entire plateau. A short, but fairly steep trail leads into each canyon and the views out across the valley toward the towering Sierra Nevada are awe-inspiring. Hiking out of each canyon and up onto the expansive plateau in spring, may yield a view of springtime wildflowers that blossom spontaneously and often abundantly here. Stretch your legs and your eyes, and open your senses to the scents and sounds of nature in renewal. The drive along Chalk Bluff road at the base of the plateau to the parking areas at the mouth of each wash is quite spectacular in itself. 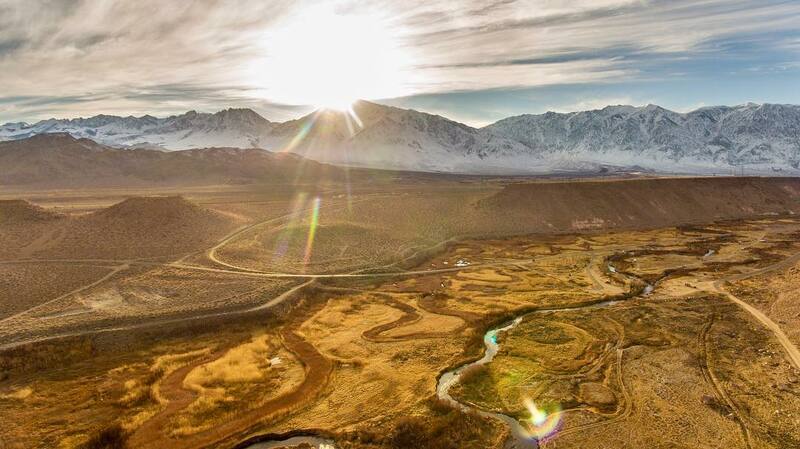 Just below the road level, the Owens River winds its way out across the valley floor and is popular with year-round anglers and bird watchers. Getting there: From Bishop drive north on US Highway 6 for 2 miles and turn left onto 5 Bridges Rd. Follow the paved road for 2 miles and, where the pavement ends, turn left onto Chalk Bluff Rd. Follow this graded dirt road for another 2 miles and park at the Happy Boulders parking area. Best time of day: Early morning or late afternoon when the sun is either rising or setting is incredible for photography opportunities. In early spring when there’s still snow on the Sierra a rising sun will paint the crest pink. An evening springtime sky is often strewn with clouds and the setting sun will cast a golden glow on the undersides. Escape the heat of the valley with a short drive up Bishop Creek Canyon. 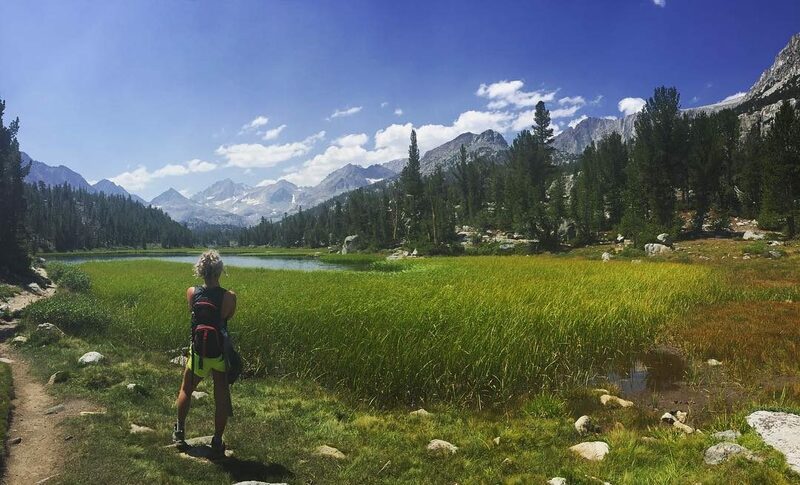 Situated at an elevation a little higher than Bishop, actually 5,000’ higher, is the lovely Lake Sabrina. Locals pronounce it “Suh-bry-na” (no one really knows why) but by the time you reach this gorgeous lake you’ll already be much cooler. 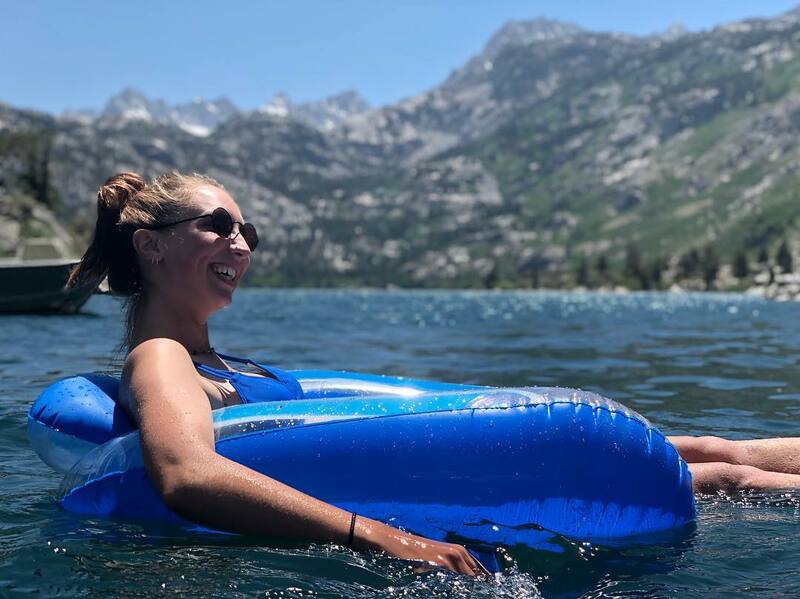 Temperatures here are 20-30 degrees lower than in the valley and the quaint café and beautiful boat landing, Lake Sabrina Boat Landing and Café, are open and accessible by road from spring to fall each year. It’s a perfect place for a half day summer outing where you can swim, paddleboard, or kayak for a few refreshing hours in and on the water. Start with scrumptious breakfast or lunch, rent a kayak or stand-up paddle board and cruise the lake. Then reward yourself at the end of your adventure with homemade pie and homemade vanilla ice cream. Nestled in the high mountains of the high Sierra in Bishop Creek Canyon, the lake level fluctuates seasonally and annually, but the beauty of the area never diminishes. Getting there: Head west on US Highway 168 (W. Line St.) for 19 miles to reach the lake. This spectacular drive of about 20 minutes from the center of town takes you up into the heart of our big backyard. Best time of day: Every hour of every summer day is magical up here, but perhaps the hours after midday and into the early evening are best. The light is usually bright and the colors are vivid on a clear summer day. Late afternoon summer thunderstorms are always a possibility in the high Sierra and it’s best to be off the water if a t-storm lets loose. 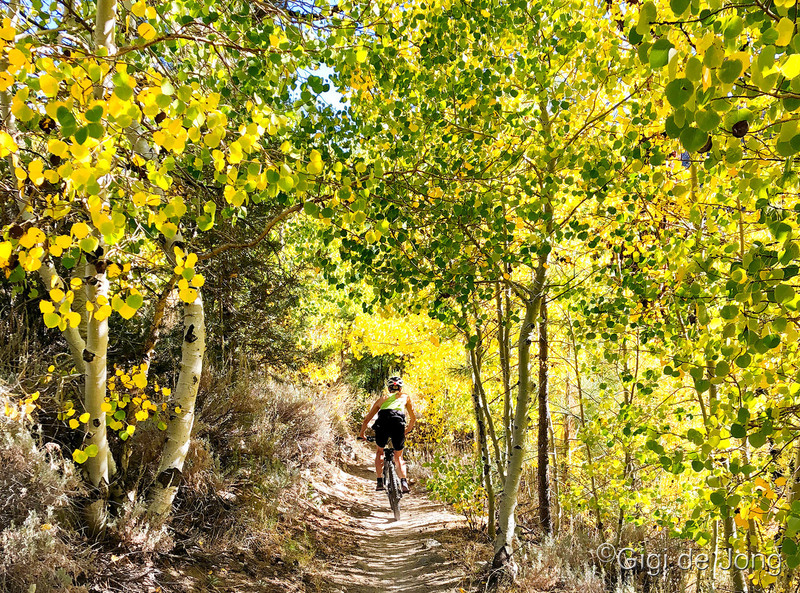 Fall is golden in the Eastern Sierra and Lower Rock Creek trail is the gold standard in mountain biking here. If you have a few hours to spare during a morning or afternoon, maximize your time by riding the Lower Rock Creek trail. You’ll see dazzling color and you’ll get an exhilarating ride down a magnificent canyon. This incomparable trail has a little bit of everything – fast, sweeping turns, rocks and roots to negotiate, overhanging tree arbors, steep-sided canyon walls, a talus field, and a swift stream with low, wooden bridge crossings. The entire trail is all downhill, but don’t let that fool you. It can challenge even the most experienced rider – it’s all about how to take it. There are three sections, each getting progressively more difficult, and you can choose to do 1, 2 or all 3. The first two sections are moderately challenging and well suited to MTB riders with some single-track trail experience. Each section ends at a crossing at the paved road running down the canyon. At the end of section 1 or 2, you can ride back up the road to your vehicle at the upper trailhead. Section 3 is a technical all-or-nothing commitment. Once you’re in it, you’ll flow down, between, up, and over rocks at the bottom of a deep, narrow canyon that runs way down the escarpment to the lower trailhead in Paradise. If you choose to go all the way you’ll want a shuttle drive to get you back to your vehicle at the upper trailhead, or a shuttle driver to bring your car down to the lower trailhead. It’s definitely all doable in a half day, but if you’re on your own, better to do only sections 1 and 2. If you have a buddy to drive a shuttle, go for the full fall adventure. This trail is also enjoyed by hikers and anglers, and dogs are welcome here too. So be prepared, be vigilant and be safe. Getting there: Drive north on US Highway 395 from Bishop for 22 miles then turn left onto Old Sherwin Grade Rd. In 400 feet pull over right and park in the clearing for the Lower Rock Creek upper trailhead. The lower trailhead is accessed by following US Highway 395 for 12.5 miles to turn left onto Gorge Rd. In 1,000 feet turn right onto Lower Rock Creek Rd. Follow the road for 3 miles and, at the U-bend in the road, turn right into the parking area for the lower trailhead. Best time of day: Temperatures in fall are warmest in the afternoon and the setting sun glows in the late afternoon in the Aspen groves along the trail. It’s a golden adventure any time of day. If you’re an angler you know that California fishing season runs from the last Saturday in April to November 15th every year. 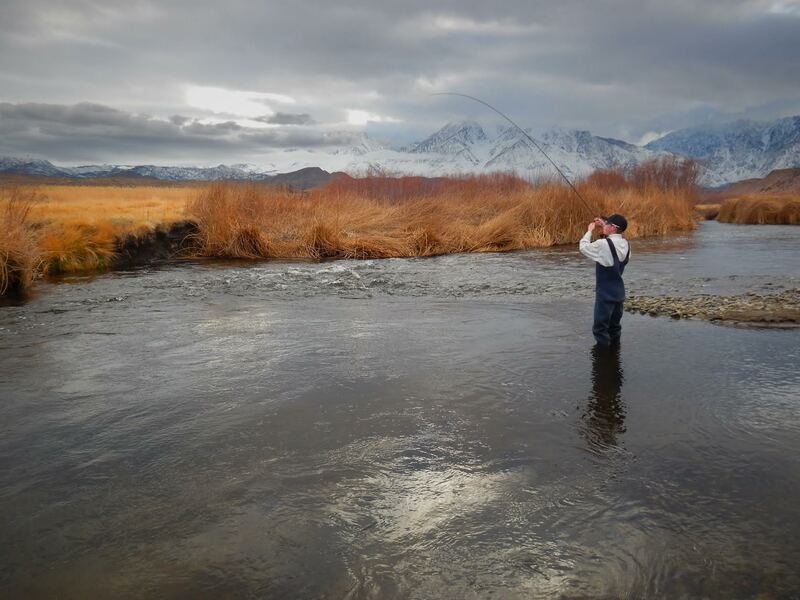 But did you know that fishing on the Lower Owens River is legal all year long? A lunchtime getaway in winter makes for a fabulous fishing experience of just a few hours. There are many points along the river that are easily accessible by car that hold the promise of exciting winter fishing with fly, lure or bait. In addition to trout in the miles of river and canals, the large reservoirs and protected ponds offer excellent opportunities to fish for carp, bass, bluegill and catfish. The Buckley Ponds, which have handicapped-accessible fishing piers, are an especially beautiful feature on the Rawson Canal. The warm sunshine of a Bishop winter day will loosen your joints and let you cast your line for a great variety of warm water fish. Getting there: From the intersection of Main and Line Streets head east on E. Line St for 3 miles and turn right onto the dirt road immediately before the Owens River. Turnouts every so often along the road will give access to the super fishing spots along the river. Follow the dirt track for 1 mile then take a slight right to head directly due south for another 1-mile to get to the Buckley Ponds. Best time of day: Winter is warmest in the middle of the day, but as the saying goes, “There’s no such thing as poor weather, just poor clothing.” Be dressed in layers and be prepared for anything. Whether you’ve spent time here or not. Whether you know our big backyard or not. Whether you stay for days or just a few hours, we’re sure you’ll find something amazing to do every season. And once you find your best fun … we’re also sure you’ll be back for more. 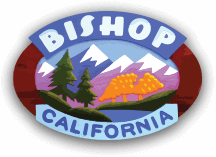 To get more information on these, and other great half-day, full-day, or multi-day adventures call us on (760) 873-8405 or come into the Bishop Visitor Center at 690 N. Main St. and speak with our friendly, knowledgeable staff. 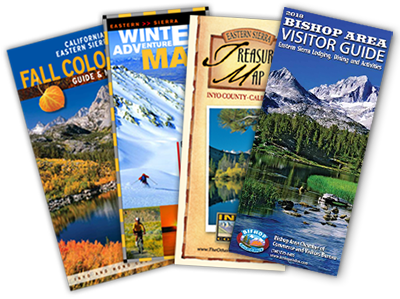 We’ll give you maps and directions, tell you what’s happening where, offer suggestions on lodging and food, and share great Eastern Sierra stories. Please share yours with us.